It’s a long way from Royal Leamington Spa to Daylesford. Award winning chef Peter Knibb, however, has been made our little town on Wombat Hill home for he and his family and finds many similarities between the two distant towns. Now head chef at Sault Restaurant at Sailors Falls just outside of Daylesford he has an interesting story to tell. Peter had the ‘go to place for relaxed fine dining’ in the 18th century spa town surrounded by undulating fields in rural Warwickshire. An upheaval saw him pull up roots, pack his family into a camper van and start travel to Australia. It was a long haul from the London kitchens of Claridge’s and Chez Nico where he started his career. Travelling through Central Victoria he and has family really warmed to the Daylesford region. In an era when restaurants now undertake global searches for even a sous chef, Peter, “just saw an ad online and responded to it by chance,” says the affable chef. “I liked the fact that Sault was run by a family team like my wife and I had at (Restaurant) 23,” he says, referring to owners Damian Aylward and Jodi Flockhart. “I loved the countryside and that Daylesford is a spa town just like Leamington,” he adds. It was serendipity at its best. Now a local and Head Chef since May he is scouring the countryside finding the best the area has to offer. He works with Florian Hofinger from Mount Franklin Organics who grows the vegetables required by Sault. “The quality of asparagus is so very good here and at this time of the year it makes a perfect companion to spring lamb,” he says. He sources much of his meat from Angus Beaumont at Daylesford Meat Co. (37 Vincent St. Daylesford. Formerly Spa Centre Meats) and does a lot of his other shopping at Tonna’s Fruit and Vegetables. (141 Vincent St, Daylesford). 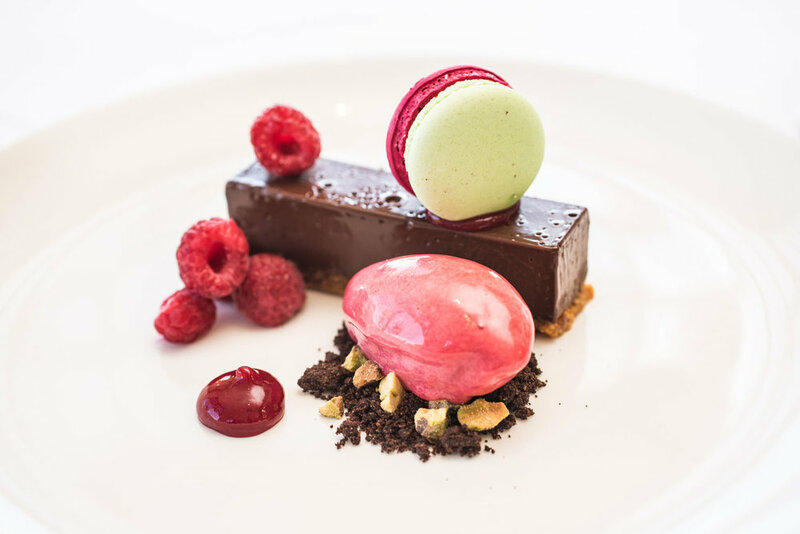 pastry work is superb with crisp, brittle macarons sitting on a finger of chocolate delice on a praline base served with fresh raspberries. Peter has also built an impressive vegetable garden, with Damien and the Sault gardeners Jon and Rhyce, overlooking the lake, lavender rows and the forest beyond. In it he has planted old-fashioned herbs such as borage and lovage. He plans to add to his repertoire of local produce, taking time to explore the countryside of his new home whilst doing so. Wandering through the garden with its well-kempt lawns, he looks out onto the late Spring sun glittering on the lake. He stops and can't help but smile. It looks like this British chef has taken root downunder.